Ahead of the Chinese president Xi Jinping ‘s state visit to the U.S this April, Donald Trump has issued an ultimatum to China, saying it’s either the Asian giant helps the U.S in putting a halt to North Korea’s nuclear program or they don’t help the U.S at all and if China refuses to, it wouldn’t be good for ‘anyone’. North Korea has advanced it’s nuclear program in the last couple of months and military experts believe it won’t be long before North Korean leader, Kim Jong-Un develops the capability to launch nukes into the United States. 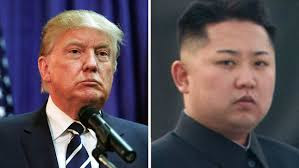 Trump has always blasted North Korea’s nuclear program, blaming former president Barack Obama for allowing Kim go this far with his military expansion, but promised he will deal with North Korea one way or the other with or without China’s help- as China has refused to support America in it’s criticism of N.Korea’s nuclear program. The U.S under Donald Trump believes China can deal with China single-handedly if they want to, as the country accounts for 70% of North Korea’s income from trade and could block their nuclear program by freezing their income but China has said so many times that the U.S keeps exaggerating Beijing’s influence over North Korea. ”If Beijing won’t help solve it, then we will alone” Trump said in an interview published Sunday in the Financial Times. China has also advised the U.S to stop military drills with South Korea and Japan as it wouldn’t help anyone. “On one hand, North Korea has violated UN Security Council resolutions banning its ballistic missile launches; on the other hand, South Korea, the US — and now Japan — insist on conducting super-large-scale military drills. It’s a vicious cycle that could spiral out of control — and such a scenario would benefit no one,” Chinese Foreign Ministry spokeswoman Hua Chunying said during a recent press briefing.